In this issue of The High Chaparral newsletter: Reunion Recap! Do you have Reunion photos to share? Email us at info@highchaparralnewsletter.com and we'll list your link in the next newsletter. Mr. Sadman, a comedy/satire movie feature film with Rudy Ramos in the role of Juan Carlos, is now available online as a paid digital download on mrsadman.com. Set in 1990, the storyline follows a Saddam Hussein body-double who loses his job, then moves to Los Angeles in search of a new start. If you haven’t checked out the trailer to Mr. Sadman, the comedy/satire feature film, then you’re missing a chance to see the recent work of Rudy Ramos in the part of Juan Carlos. Friday, October 16, 2009 marked the official beginning of The High Chaparral Reunion weekend at La Posada. At 9:00 am the first fans arrived for registration and received their custom leather name tags, hand crated by Rusty. 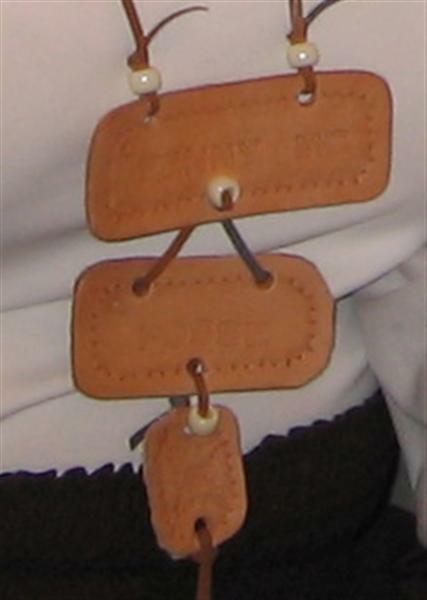 The tags were a big hit with fans and cast, and Sponsors and the Posse – those who helped work on the reunion – had their own special tag. Fans picked up a wonderful gift bag from Susan McCray, containing a High Chaparral 2009 Reunion coffee mug, a CD of High Chaparral music (with the Theme from High Chaparral and Harry Sukman’s High Chaparral Suite), a cast photo to collect autographs, and a photo button of the ranch house to wear. The large white gift/tote bag even had a photo of the ranch house! Arbuckle's Coffee generously provided gifts of a coffee mug, a pack of the coffee that won the west, peppermint stick, and history of Arbuckle Coffee. Don Collier is Arbuckle’s official cowboy spokesperson, you can listen to Don on their website. Henry Darrow, Denny Allen, Bob Shelton, Susan McCray, Kent McCray, Don Collier and Rudy Ramos at the Friday Discussion Panel. photo by Chris Casey. While people met and got acquainted, they perused the weekend schedule, watched an episode on the large screen, shopped auction items, and read a history of David Dortort provided by Andy Klyde. Sponsors admired their own souvenir copy of The High Chaparral Reunion 2009 invitation with artwork by Patty Schantz. Bids were made immediately at the silent auction table, especially on two hotly contested goodies – Patty’s beautiful large prints of John and Victoria, and Buck and Blue. Other heavy hitters were The High Chaparral Songbook, Annual, and HC paperback books. After lunch at Miguel’s at La Posada we resumed with a two hour panel discussion featuring Henry Darrow, Rudy Ramos, Don Collier, Kent and Susan McCray, Bob Shelton and head wrangler Denny Allen. during the Friday panel discussion. photo by Penny McQueen. 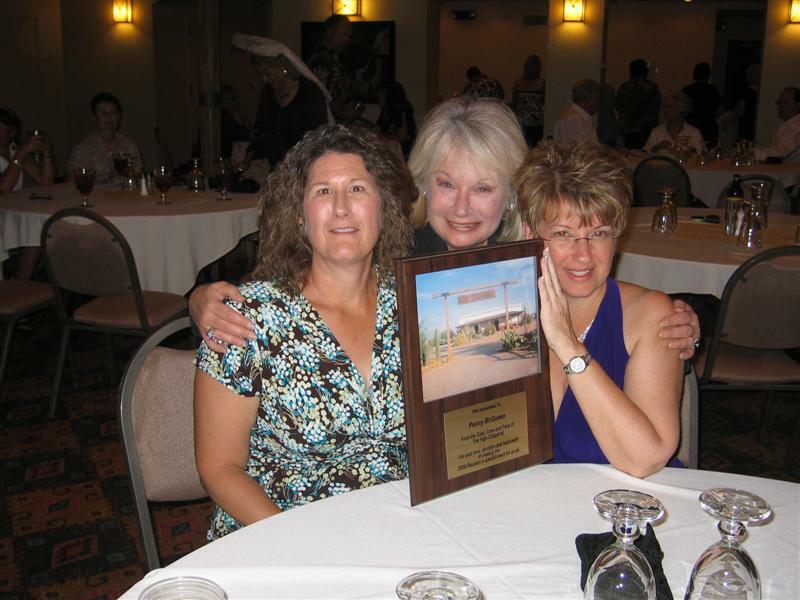 Jan Pippins and Susan McCray present Penny McQueen with a plaque at The High Chaparral Reunion Sponsor's Dinner. photo by Crystal Hudson. At the 7 pm Sponsor’s Dinner, Penny McQueen, reunion organizer, recognized the Sponsors, whose generous contributions made it possible to bring The High Chaparral home to Tucson. Announcing ‘dinner is served’ she was interrupted by Kent and Susan McCray and Jan Pippins, who had an announcement of their own – presenting her with a lovely recognition plaque from the cast, crew and fans of The High Chaparral. It reads, “With Appreciation To Penny McQueen From the Cast Crew and Fans of The High Chaparral for your love, devotion and hard work in making the 2009 Reunion a special event for us all.” When Penny began to thank everyone, Big Daddy Kent McCray shushed her as he wasn’t quite finished speaking, proving once again he is still definitely The Boss when it comes to all things Chaparral! Dinner was followed by Arbuckle coffee and cookies, then high quality, uncut High Chaparral episodes provided by Andy Klyde. 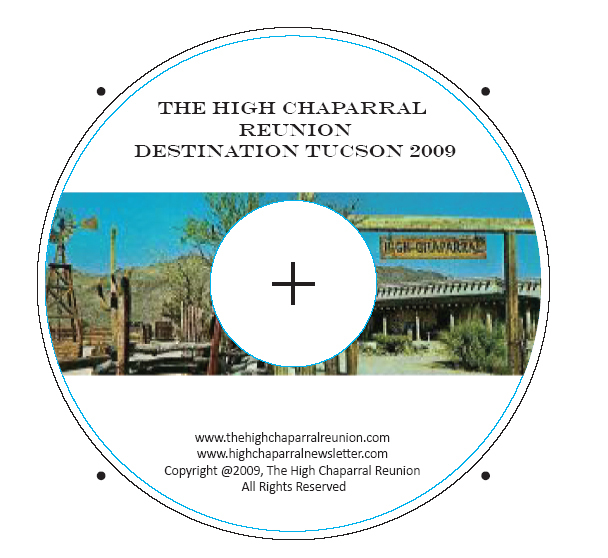 For the complete panel discussion and coverage of the entire day at Old Tucson, get your copy of The High Chaparral Reunion 2009 DVD. Although she was unable to attend the reunion, Ann Erickson, wife of Leif Erickson (John Cannon) sent a special message to all High Chaparral fans. "Hello to all The High Chaparral gang. 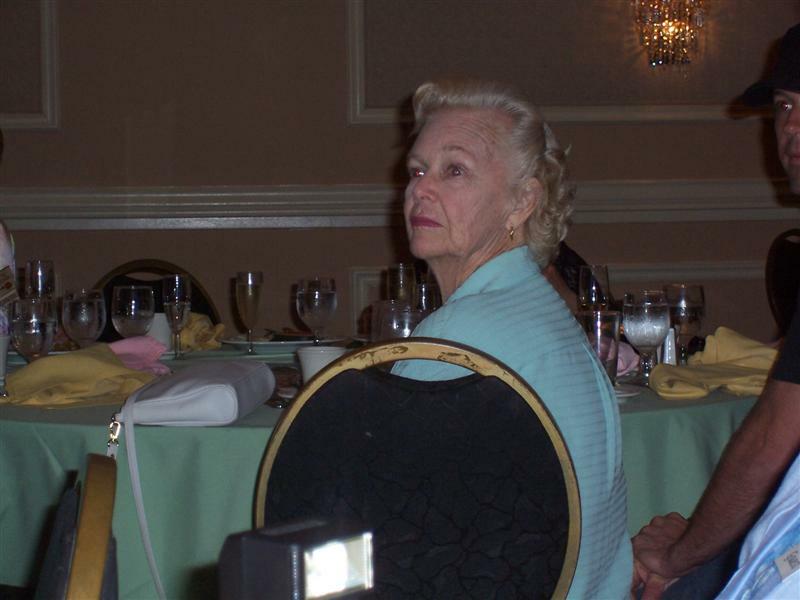 This is Ann Erickson wishing I could be there to enjoy the Reunion celebration and the memories with all of you. I know it’s wonderful being back in Old Tucson! What many great memories there are! $25 plus shipping/handling. Payments are processed securely via Paypal. Order here. Kent McCray talks to fans at The High Chaparral set. 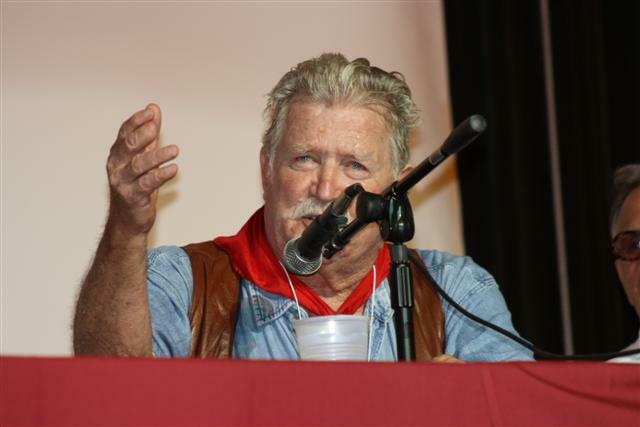 Kent McCray, production manager/producer of The High Chaparral, began the day Saturday, November 17, 2009, early by taping footage for a special souvenir DVD. One of the most unintentionally comic moments of the day was provided by the guard at the employee gate, who innocently asked Kent – who personally chose Old Tucson for the location shoots and handled daily production at the site for over 4 years, “Have you ever been here before and are you familiar with Old Tucson? Do you know how to find The High Chaparral set?” As Kent answered with a firm, “Yes!” and the other occupants of the car snickered, the bemused guard waved in HC’s Big Daddy, back to The High Chaparral. Don Collier, waiting for the fans to arrive, laughed, “We’re waiting here for the Reunion to start – all we’re going to do is eat and drink! We’re not going to kill any Indians or shoot any Producers, that’s all we’re doing today.” Describing the morning’s planned activity Don said, “We’re going to greet the people, sign some pictures and tell a few stories. We’re all here, and the rest of the folks are here in spirit I think.” As the cast members walked the familiar set, looked at their own photos, touched the porch poles and ran hands along the divider, they told stories and expressed thanks for the fans who’d brought them home to Tucson. And once the entrance gate opened, that’s exactly what happened at the Cannon ranch house. Fans streamed through the gate and swarmed the location set, quickly filling the house and spilling over onto the porch and yard. Local extras, stuntmen and actors from Tucson who worked on the show came to reconnect with their colleagues and meet fans, telling their own backstage stories and adding to the excitement. The original buckboard used in the series was at the ranch compound, along with a special sign board of cast photos. The buckboard, on loan from a western museum, is on display at Old Tucson until January, and was obtained specially for the Reunion. Henry Darrow drew many who were determined to meet the famous heartthrob. Commenting first how energizing it was to meet dedicated fans and reconnect with friends from the show, he also quipped, “What I don’t like to see is that we’ve gotten older!” Darrow was delighted and stunned to meet the newest generation of fans at Old Tucson, 7 and 9 year old boys attending with their parents. The littlest fans became hooked watching Chaparral episodes on YouTube, proof the show has weathered the years and is still captivating an audience in the digital age. After a private lunch at El Vaquero – with gifts of a custom made High Chaparral tote bag from Kola’s Screen Graphics of Tucson and a gift bag that included samples of popcorn from Copper Kettle Popcorn - the afternoon program at the Grand Palace Hotel and Saloon started with a slide show and music presentation. As it played on the big screen the cast members took the stage. For over an hour Kent McCray moderated questions from the audience as Henry, Don, Ted and Rudy answered. 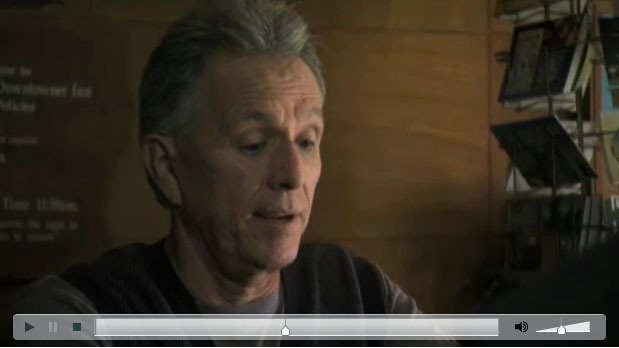 A very special highlight was a recorded message from Bob Hoy, made by Susan McCray. Bob sent his greetings to all the fans, cast and crew, saying he couldn’t make this reunion but would be at the next one. He recognized all his friends in attendance, and thanked the fans. Everyone gave Bob a standing ovation. Saturday's festivities concluded with a Cowboy Barbecue on the patio at La Posada, and episodes in the hospitality room. Don Collier answers a question at the Grand Palace. photo by Patty Schantz..
At Old Tucson on Saturday afternoon, our stars participated in a panel discussion at the Grand Palace Saloon at Old Tucson. Moderator Kent McCray took questions from the audience and kept Henry Darrow, Don Collier, Ted Markland and Rudy Ramos in hand - as much as possible. The cast mates were often like The High Chaparral Comedy Tour, joking and drawing huge laughs from the audience. Kent told about Joanna Moore (Lady Fair) losing her dental work at lunch. Kent sent workers to recover it from the dump….whereupon Ms. Moore brushed the dentures off, popped them in her mouth, and shot the scene. “That’s called a real trooper!” according to Kent. Rudy Ramos laughs at a story. Photo by Patty Schantz. 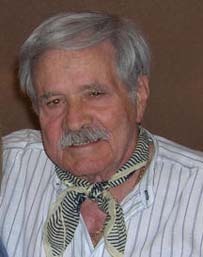 Although Bob Hoy was unable to attend, he sent his greetings in a recorded message made by Susan McCray, Sending “cordiality and good cheer” to all the fans and his friends in the cast and crew and wishing all “Godspeed and God bless’”, Bob’s message made everyone’s day and earned a standing ovation. High Chaparral stars (and fan Penny) at the Sunday morning autograph and photo shoot. photo by Crystal Hudson. An event the size of the reunion takes a LOT of people working hard to make happen. The 2009 Posse - those who worked hard to keep all the events running smoothly - poses with the stars. 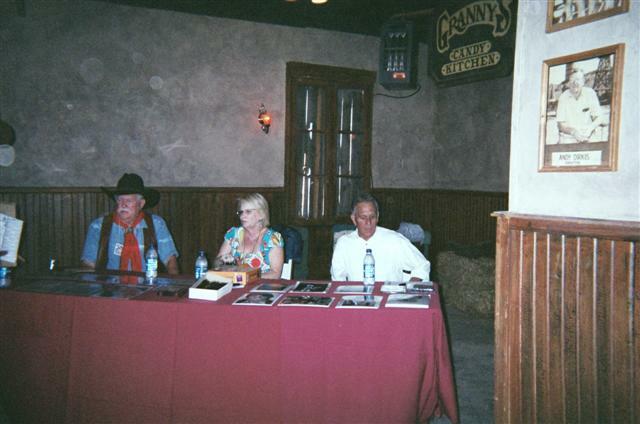 Front row: Rudy Ramos, Henry Darrow, Penny Mcqueen, Don Collier. Second Row: Ginny Shook, Crystal Hudson, Andy Klyde, Vickie Harvey. Back Row: Rusty LaGrange, Jan Pippins. Not shown: Mike Pippins. Thanks also to the staff at La Posada and Old Tucson. After 42 years The High Chaparral can still generate media interest! Local Tucson television channels came out to cover the reunion, and newspapers ran feature stories. Below are two articles on the cast and reunion festivities. Henry Darrow at the Friday Q&A. Photo by Patty Schantz. They may have been fresh off the plane from Hollywood, but the Cannons and the Montoyas had just as much mud on their chaps as any other cowboy in the Wild West. OK, so they were characters being played by actors, but one would have never known that after looking at those Tucson Mountains in the background. The cast and crew of The High Chaparral will return to Tucson for a reunion event at Old Tucson Studios, where the show was shot from 1967 to 1971. The reunion will begin with a morning program at The High Chaparral ranch set, where attendees will hear stories about the golden days from producer Kent McCray and various actors. A luncheon is closed to the general public, but following that will be an open discussion and Q&A with cast members. Episodes will be shown at Old Tucson Studios all day long. Guests will include Henry Darrow, Bob Hoy, Tucson's Dan Collier and other cast members. Event-goers, and especially those familiar with the show, can expect a nostalgic visit to the set. Penny McQueen, an event organizer, says that her love for the post-Civil War-era show stems from its historical realism. McQueen claims that, unlike counterparts like Little House on the Prairie and Bonanza, this was first Western series to be shot onsite—a site where Apache leaders fought Spaniards and American settlers. "The dirt and the dust and the grit and the sweat—it all had this terribly authentic feel," says McQueen. She is the editor, publisher and main contributor to The High Chaparral Newsletter and Web site (www.highchaparralnewsletter.com). As if the historical value of the desert landscape were not enough, the part of Cochise, a legendary Apache leader, was cast in true Southwestern spirit: A direct descendant of Cochise himself, Nino Cochise, was in his 90s at the time and was missing one leg, but the hobbling old man with the impressive lineage nonetheless won the small role. While The High Chaparral made a name for itself among Western buffs, it also gave Tucson a claim to fame. "High Chaparral was a very important series to Old Tucson," says Frances Causey, film manager at Old Tucson Studios. "It was such a highly successful show on NBC, and it had a serious impact on the Western genre." Causey says that the reunion will offer an opportunity to get Tucson back on the map by introducing Old Tucson to the newest generation of movie buffs and television fans. She is currently working on five projects that could get the green light to be filmed at Old Tucson, including Ghost Wolf. If business were to start booming, she foresees an economic boost for all of Tucson. "The economic impact of film is so great. Just think: So many people in the town—even the dry cleaners who cleaned the cast's costumes (in Chaparral)—benefited," Causey says. "We are trying to bring film production back to Tucson." It is not enough to just film shows here, though. In order to bring attention to Tucson, that show has got to have a lasting following, like Chaparral. "When I first watched it, I watched at a point in time when I could believe it was real," says McQueen. "I've carried it in my heart for all these years." A band of loyal followers has continued to support the show, organizing a reunion every two years since 2003. This is the first reunion held in the Old Pueblo. "The fans overwhelmingly wanted to come to Tucson, to bring the show back the ranch," says McQueen. 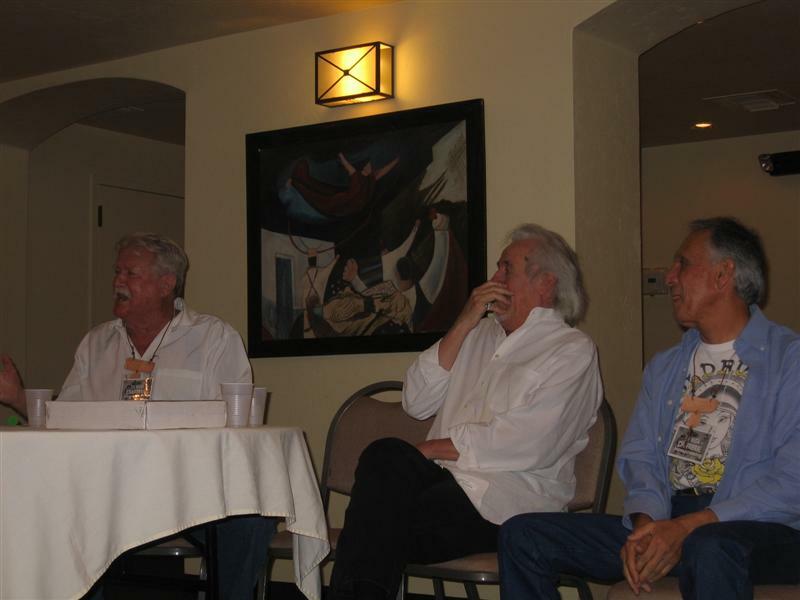 The High Chaparral Reunion was held on Saturday, Oct. 17, 2009 at Old Tucson Studios. The High Chaparral Reunion 2009 fans and stars pose for a group photo at the Sunday morning autograph session. First row (l to r) (seated on floor: Debbie Benner, Nieves Fernandez, Crystal Hudson, Brenda Greenwood, Paul Carter. 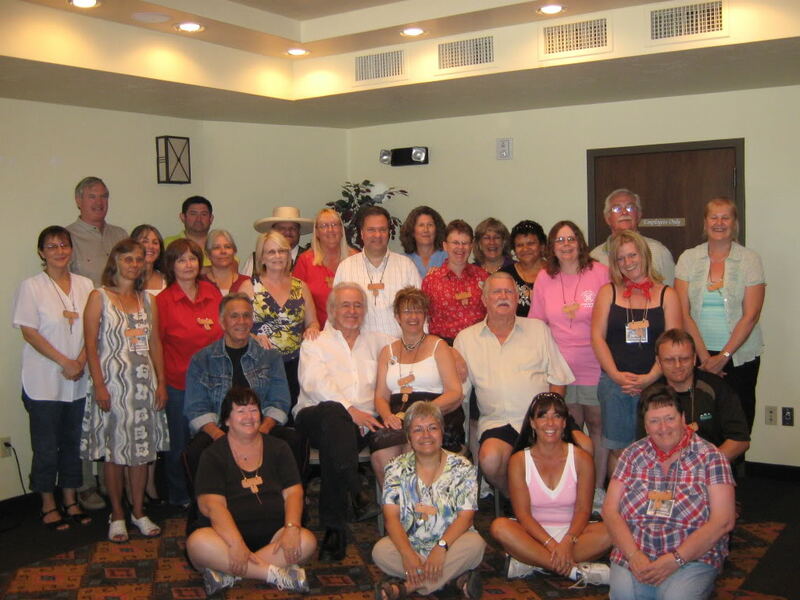 Second row, seated: Rudy Ramos, Henry Darrow, Penny McQueen, Don Collier, Third Row: Heleen Helsdinken, Sandra Smithers, Ginny Shook, Andy Klyde, Vickie Harvey, Amy O'Donoghue, Teddi Giggy, Paula Evans. Fourth Row: Luisa Victoriano, Bernice "Snookie" Marier,, Rusty LaGrange. Back row: Mr. Marier, Plinio Orellana, Chris Casey, Jan Pippins, Patryka Duran y Chaves, Gene Giggy, Linda Cope. Photo by Alan Cope. While the sun and sand and horse pies are similar to what they were decades ago, the players in what was one of Tucson’s biggest forays into TV production have changed a bit. CLICK HERE TO READ THE REST OF THE STORY.